REPORT FOR "Helping hands for Vrindavan"
We are beginning a new year full of enthusiasm and desire to serve Sri Mayapur Dham Vrindavan. We have been covering different areas of work in Vrindavan related to cleaning, restoration and maintenance of temples, the environmental education of children and adults, protection of the river Yamuna and the cultivation of plants and trees in a healthy and organic way. We are currently working in 7 different projects: Restoration of Radha Gopinath Mandir gardens, cleaning Vrindavan, farm for organic crops and Hanuman Mandir afternoon tuition school, Vrinda Kunja Vivero, digging a new channel for Yamuna and Friends of Mayapur. We thank all those who collaborated in our program during the last two years and also invite you to participate in “A helping hand for Vrindavan” as a Sponsor or Volunteer. With much affection from the team for “A helping hand for Vrindavan”. This is a report of what we have done recently in Radha Gopinath Mandir, Vrindavan. I had this project on mind for long time and this Kartik month, with the help of many of our devotees, we finished the rock garden (first of four gardens), which is right in front of the five hundred years old historical Mandir of Gopinath Mandir (Madhu Pandit and Raghunath Das Goswami). This is the only temple of the original temples of Six Goswamis still in private ownership and, for some reasons, it has been quite ignored, so we had the opportunity to get involved. 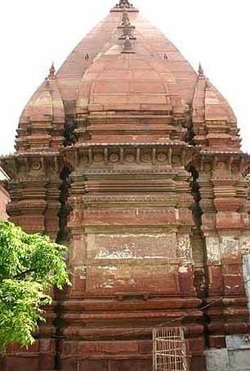 I hope that the original Mandir will be restored one day; the damage is not so huge compared with the other temples. 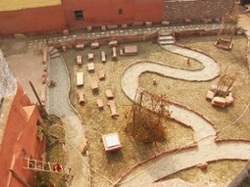 We made our own garden with all the stones, which had been broken by the Muslims, when Aurangzeb attacked this temple. The Goswamis of the temple are quite friendly and very appreciative of our work. Everything seems to be like a unique arrangement. 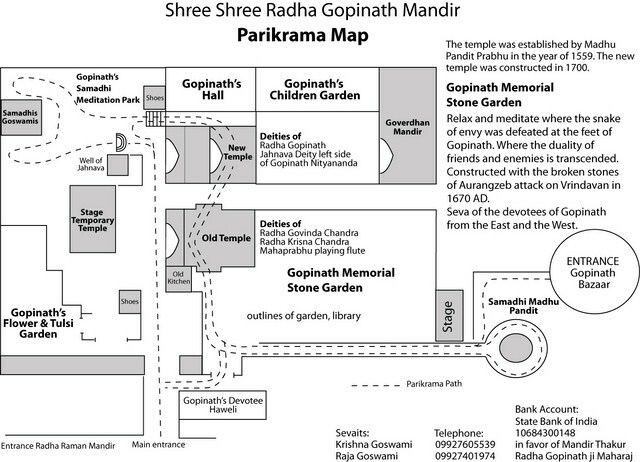 The rock garden is called “Gopinath Memorial Stone Garden”, where the duality of enemies – friends and the snake of envy had surrendered to the Lotus Feet of the Infinite Enchanter. I just wanted you to know of the progress, I hope that through this beautiful garden we may inspire someone to take out the task of restoring the original building. We are also trying to present the Mandir as a World Heritage building. We get depressed sometimes by the advancement of Kali Yuga and its impact on the Holy River and other aspects. Sometimes hopeful we try to do something about it. We are also continuing with our cleaning project in Vrindavan and Mayapur very successful along the river front and partially successful in some other areas. Many devotees from our temples are sending monthly donations for this seva, to keep the cleaning project alive and growing. For me, personally, it is a very nice experience. Missing all of you very often.